Download our dropship datafeeds in any format of your choice. What is the Dropship Datafeed Plan? If all you need is product images and descriptions for drophip products, then this plan is for you. We integrate products from over 90+ drop ship suppliers and make the avaible for you to download from one single place. Our data feeds are updated daily so you can download them as often as you wish to keep your website or your marketplace account up to date. Our Dropship Data Feed Plan will give you access to ALL our Standard Feeds for ALL our integrated suppliers. You can also order up to 3 Free custom feeds (marketplace feeds & shopping cart feeds). Additional custom feeds are $8.99/month. Download our Standard Feeds in a CSV format or TAB delimited format. Our feeds are provided per supplier. Each supplier will have its own feed that you can open with Excel. We also include all product images in a ZIP file provided on a per supplier basis as well. Our feeds are updated daily and include all the product data available such as Item numbers, Item names, Descriptions, Categories, MAP, Wholesale prices, Retail prices, UPC, Quantity in stock, and many more. Import dropship products to your own shopping cart and instanlly offer thousands of products for sale on your own website. Our feeds are pre-formatted and ready to be used with many third party shopping carts. 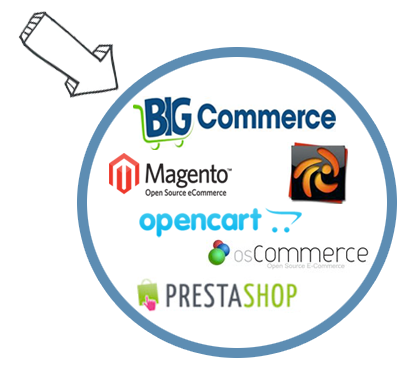 We support the most popular carts on the market such as Shopify, OpenCart, BigCommerce, Prostore, ZenCart, Xcart, OSCommerce, and more. Can't find a feed that is compatible with your shopping cart? No problem. We can also create new feeds according to your shopping cart specifications or according to your feed templates. Import products to any Marketplace website of your choice and increase your market reach to even more potential buyers. 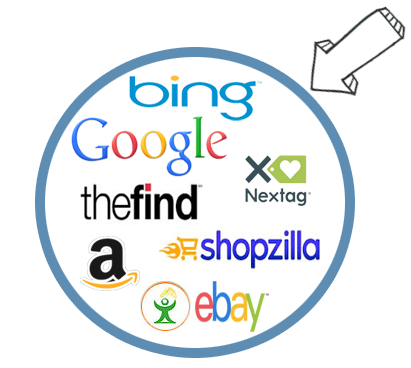 Our marketplace feeds are ready to be imported in the most popular Marketplace websites like Bing, Google, TheFind, Amazon, Bonanza, Pronto, Shopzilla, and more. We can even create new feed templates for new market places of your choice. Simply send us the feed specficiations or feed template, and we will create it for you. Do you also provide images? Yes we do. You will also be able to download large and small images for each of our integrated suppliers. 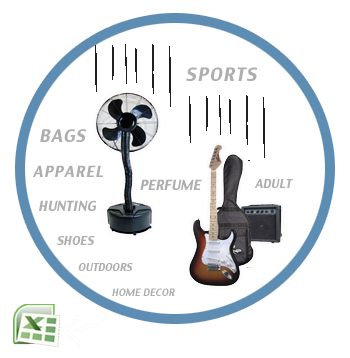 The item number will match the file name of the image so it will be very easy for you to match images to item numbers. The files are also compressed in a set of ZIP files to make the download quick and efficient. Are the feeds kept up to date? Yes. Each datafeed are updated on a daily basis. This includes adding new products, updating the inventory status and quantity in stock for each product as well as removing discontinued items. The image zip files are also kept up to date. Can I get custom feeds? Yes, we can provide feeds for any type of shopping cart. Those are considered as custom feeds. Our datafeed plan allows you to download all our standard CSV files as well as up to 3 custom feeds of your choice. Additional feeds are $8.99/month. We can also create new feeds if you require a new template which we do not have. In this case there is a one time setup fee of $79.99 to add a new feed template according to your specifications. Do you import the feeds to my site? No we do not. We only provide you with the URL to your feeds and you are responsible for downloading your feed as often as you wish and re-import it to your website. Your feed will be updated daily however you will be responsible for using it to keep your own website up to date. The dialy automated updates is provided with our website plan only. In this case we update the website for you automatically every day. Do you have feeds for Bigcommerce? We no longer offer feeds for BigCommerce since we now have a new App that can synch up your store with your list of products. Please refer to our BigCommerce App for more details. Do you have feeds for Shopify? We no longer offer feeds for Shopify since we now have a new App that can synch up your store with your list of products. Please refer to our Shopify App for more details. Do you have feeds for Magento? Yes we do have a feed template for the Magento plateform. This is considered as a custom feed so you will be able to order up to 3 free custom feeds and additional feeds will be $8.99/month. Do you have feeds for OpenCart? Yes we do have a feed template for OpenCart. This is considered as a custom feed so you will be able to order up to 3 free custom feeds and additional feeds will be $8.99/month. Do you have feeds for Goole and Bing? Yes we do have a feed template for Google and Bing. These files are considered as a custom feeds so you will be able to order up to 3 free custom feeds and additional feeds will be $8.99/month. Can I Read The Drop Ship Feeds With Excel? Can I Dropship On Bonanza? Can I Import Drop Ship Products To Big Commerce? Can I Import Drop Ship Products To Shopify? Are The Data Feeds Updated Daily? 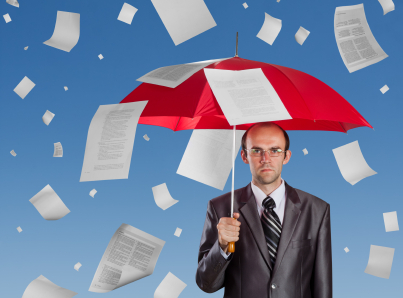 Is Your Services Compatible With Volusion?